My next door neighbour was given a guitar when I was around 11 or 12. He probably hung onto it for around a year but I don’t think he ever touched it. We were friends and I asked him whether I could borrow it. I don’t think I ever gave it back. There’s nothing more depressing than trying to learn the guitar on one that’s out of tune. My parents bought me the Pete Seeger Guitar Tutor record, which was a 12-inch vinyl record that came with a book that explained the lessons and showed you chord charts. The first lesson was how to tune a guitar using a pitch pipe. The Stratocaster was my boyhood dream guitar. I loved Hank Marvin playing the Fender Stratocaster but I always wanted to sing and play. As a teenager in Cambridge I used to spend a lot of time in a music shop called Ken Stevens. It was very narrow with guitars all the way down both sides. There was a Stratocaster hanging in there for years, which we sometimes persuaded the owner to let us touch or play the occasional tune on. I could never afford it though. When I was young I copied every other guitar player. Copying is where you start and a big part of the way forward. After a while you find that all that stuff merges into something that becomes your own sound and style. The first guitar my parents bought me was a Tatay. It was a classical type Spanish guitar. I think I’ve still got it somewhere. I always had a fondness for Gretsch guitars. Maybe it’s because Duane Eddy played a Gretsch in his early years. You can hear a guitar on a track on the radio and you can usually tell when it’s a Gretsch. My first electric guitar experience was with a Selmer Rex archtop guitar with F holes. They were popular with jazz guitarists and were designed with space for a pick-up to be added. I bought a pick-up, put it on and things moved on from there. I didn’t want to specialise in one area, I wanted to learn a bit of everything. I wanted to be able to play Elvis Presley and The Everly Brothers songs but I also loved acoustic music, as well as Rock and Roll I loved folk music and I loved acoustic blues music. I was listening to Pete Seeger, to Woody Guthrie and Lead Belly, who was one of my favourites and a great player of the 12-string guitar. British radio was very haphazard when I was growing up. The strangest pieces of music in all sorts of different categories would follow on from each other. I rather liked that. Someone counts, one, two, three, four and you’ve got to be there, you can’t stop. If you make a mistake, you can’t go back and fix it; you’ve just got to keep moving on. There’s nothing like being in a group of people who are playing something to improve your learning. My first Fender was a Telecaster. My parents gave it to me for my 21st birthday. They lived in New York and had a friend of theirs, who was coming to Paris where I was living at the time, deliver it to me. It was an enormous thrill. I don’t look back at my career and think this was a great solo and this one wasn’t. I just do them, and hope for the best. Manny’s was a very New York experience. I bought the Black Strat from Manny’s in 1970. The shop was already legendary. It’s hard to describe but it was a wonderful place. I helped mix the sound for Jimi Hendrix at the Isle of Wight Festival in 1970. Not a lot of people know that. I bought the Martin D-35 acoustic from a man on 48th Street in New York. I was going to Manny’s to buy an acoustic and this guy came up to me and said, ‘What do you want? What are you getting? Then he pulled out this guitar. I had a strum and said, ‘Okay, that will do.’ It was very nice then and still is gorgeous. 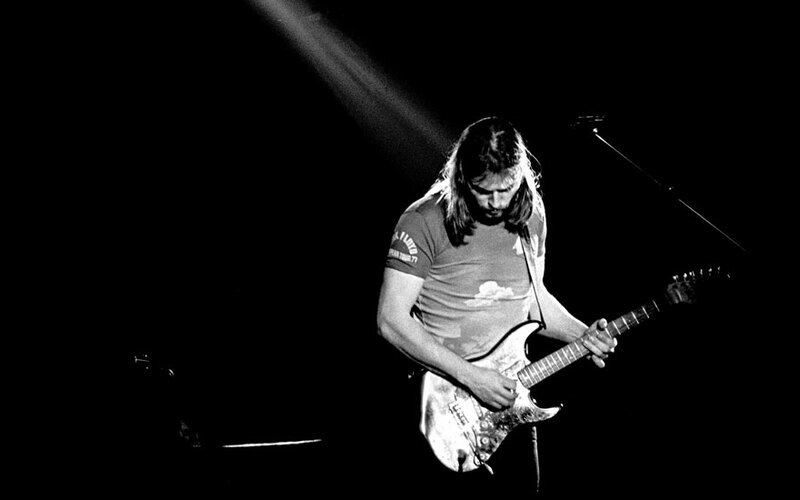 The Stratocaster tends to enhance the personality of the person playing it. People playing Fenders are more recognisably themselves than people playing some of the other well known guitars. The Black Strat was just a guitar. It was my guitar; it was the one I used. What can you say? It has earned its keep. I’d always kind of wanted a Gibson Les Paul. We used to be sent various circulars of guitars that were on sale throughout the world. There was one guitar trader in New Jersey who had the 1955 Les Paul on his list. It was all gold — the back and the sides and the back of the neck, and it looked great. I bought it and had it sent to LA where we were working on The Wall album. Not long after it arrived I used it for the solo on Another Brick in the Wall, (Part 2). We injected it straight through the desk and onto tape, not through any amplifier at all. I’ve always loved that guitar. Back then, for someone like me, travelling in the States was like going into a candy store. You could go into an old junk shop and among all the AK47s and other terrifying things for sale there would be guitars, old guitars. Several of the guitars that I own were bought in second hand stores around the United States, and in Seattle particularly. In London they were harder to track down. Pieces of music often present themselves when you’re strumming. A couple of notes can make a little connection in your mind so you play them again and then they expand a little bit. Ninety per cent of the little tunes I play, later on don’t seem to have any particular meaning or magic. And then you play something else and it has a magic to it and you hope that magic will work for other people too. There’s no real way of explaining that or understanding quite how that works. I didn’t hunt for the notes on Shine On You Crazy Diamond, they found themselves. I was sitting playing my Black Strat with the chaps in a rehearsal room in King’s Cross and somehow they fell out of the guitar. There are fortunate moments when someone has told you something and you’ve got it wrong. I had some friends who were working at Abbey Road on an album. Bruce Welch, the rhythm guitar player in The Shadows, was producing them. They had put down a couple of acoustic tracks and he said he wanted to put a high strung guitar on as well to thicken the sound of the acoustics. I didn’t know what that was but it sounded interesting and I decided to work on my own version, so I put some thin gauge strings onto one of my Ovations. I found out later it wasn’t remotely what the normal high strung tuning was, but it worked for me. I wrote what became Comfortably Numb on that guitar with that tuning. It has remained in that tuning ever since. I like the older guitars. It feels like they have been played a lot over years, and the vibrations of the different pieces of wood that make up the instrument have melded into one overall sound that’s beautiful. I once used a Jedson guitar to break my way out of a room I was trapped in. I lived in a house in the country that had a little guitar room with old fashioned studio doors that clamped shut. Late one night the door handle broke and I couldn’t get out. I was trapped inside with nothing but a load of guitars. This was long before mobile phones, so I took the leg off a slide guitar and used it to break out. Guitars are always there and I doodle on them every day. Often I’ll take out my iPhone and record the doodles. I have hundreds. They give me ideas for songs. One of these days I will have a listen through them and decide on some to take further. These are instruments that have served me very well. They’ve given me music and I’ve loved them, but now it’s time for them to go off and be part of someone else’s musical life. I’m hoping they’ll inspire music in other people. All these guitars have their individuality, their own tone and some element of magic about them. I hope that I can do some good by selling them and using the money to help to make this world a slightly better place.